Free Installation Quotes. Tap here! 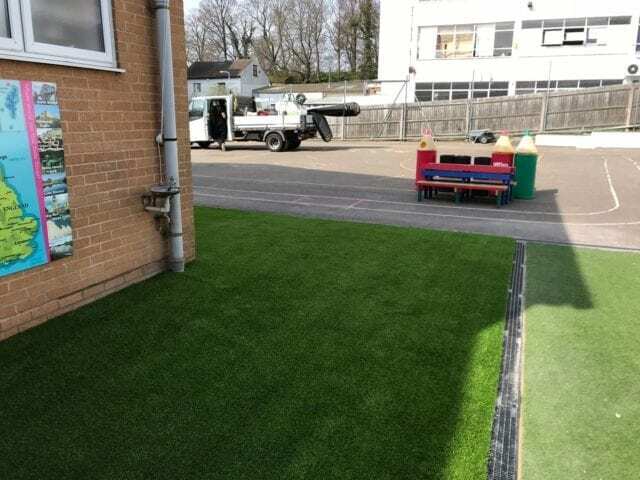 St Martin’s Nursery and primary School liked our grass so much they asked us to come back and install some more! 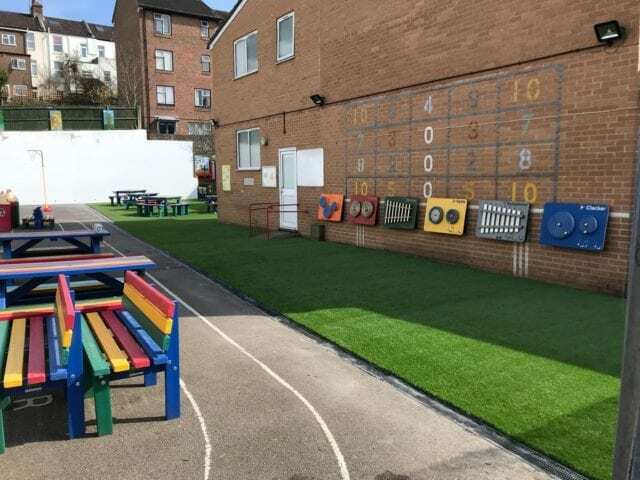 We’ve added to their installation with Trulawn Prestige, a lovely soft grass which is ideal for young children. As this is a lay only installation on top of existing concrete, we’ve left the drain line between the two areas uncovered. This will help any excessive rainfall drain away from the area. 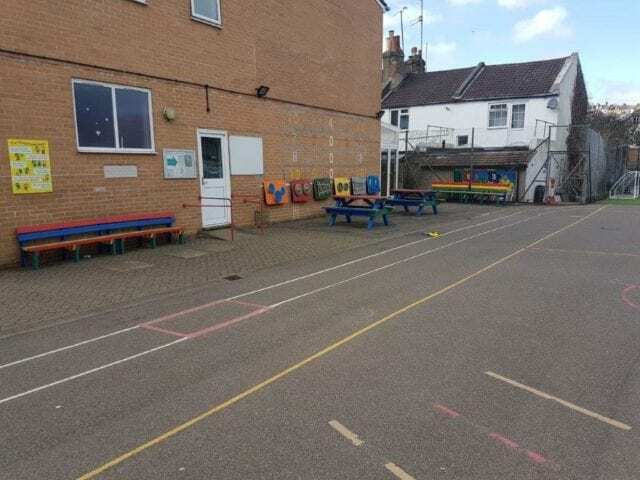 In an enclosed concreted playground, this lovely section of green makes a huge difference to the appearance of the school and the activities of the children who enjoy it! 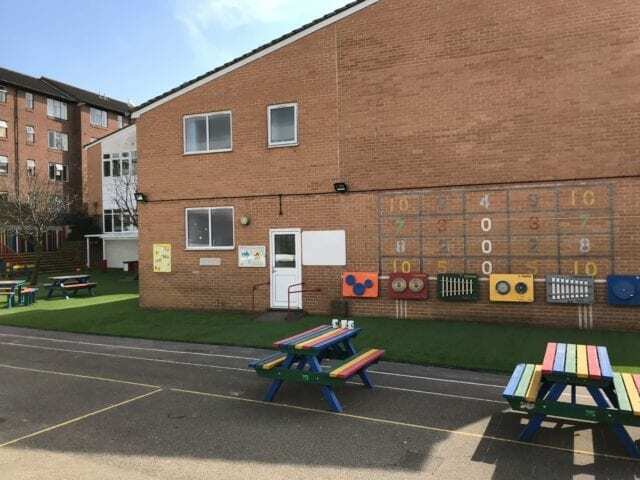 Take a look at our previous installation at St Martins Nursery and Primary school. Simply complete our quick and easy installation quote form, and Trulawn® will be in touch to discuss your requirements. Trulawn® can carry out an on-site installation survey at a time and date that suits you, to provide an accurate quote for artificial grass installation. Made specifically to match colour of British lawns. 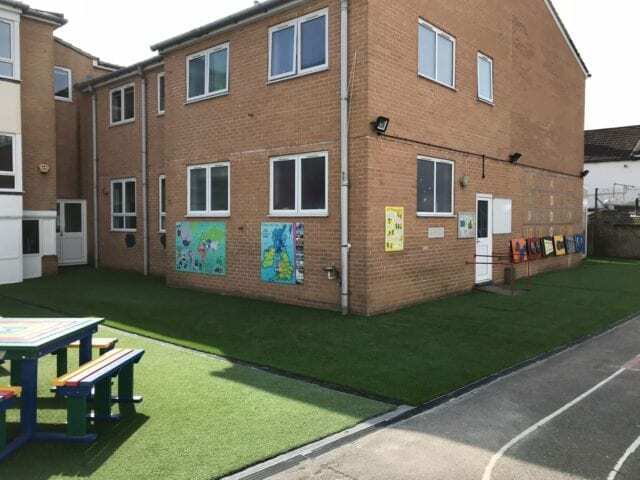 Trulawn, playtime friendly artificial grass, we specialise in supplying and installing artificial grass for schools and child safe surfaces for play areas. We can install a soft shockpad underlay when installing the grass that creates an even safer, cushioned feel to the surface. 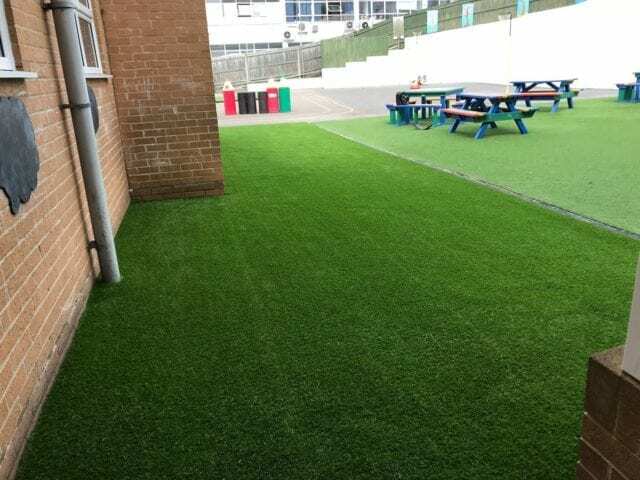 Trulawn's artificial grass is a pretty tough product, it’s designed to withstand the rain, sun, wind, hyper children and playful pets. Safe for pets, dogs LOVE it. Artificial grass is made of soft and springy materials, which most animals find is perfect for running and rolling around on all year long! Introduce your family pets to our artificial grass and see how much they enjoy their new playground! 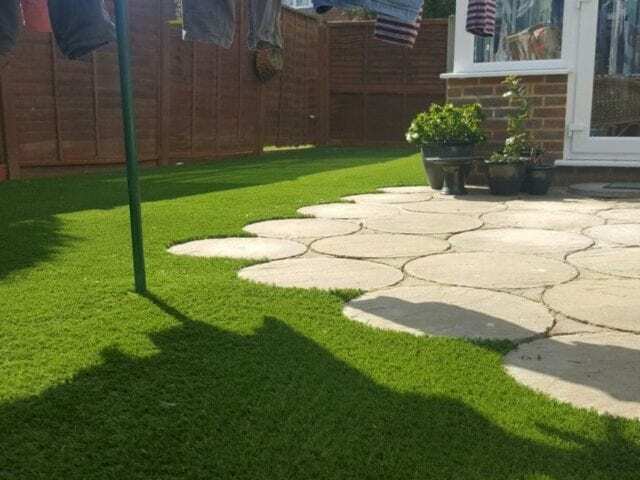 Trulawn grass is covered by our guarantee, but we ensure that our synthetic grass is fully stabilised against UV fading so you have peace of mind for years to come. Other, lower quality grasses from alternative suppliers may not provide protection against fading from intense sunlight and weathering nor might they provide a guarantee. Paw prints and muddy boots, the horror! For most homes, when the rain comes (and it comes pretty frequently in the UK! ), you can bet that somebody is going to end up walking mud through the house after being in the garden, whether it's children or dogs! 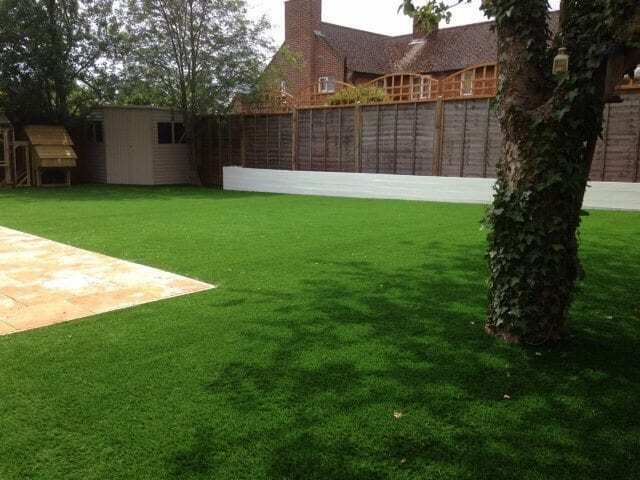 Trulawn’s artificial grass installations make those worries disappear! Rain or shine, keep your schedule and your home mud free! 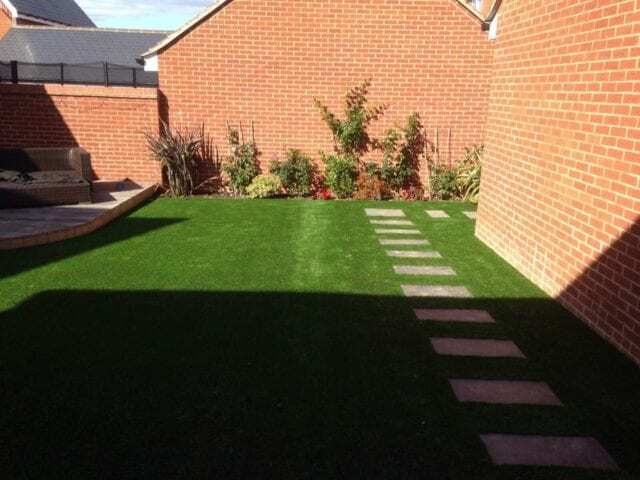 Artificial grass is essentially maintenance free, obviously, you no longer need to cut your grass. So bin the mower and enjoy the time you would have spent dragging the mower in and out of the shed, emptying the cuttings and walking back and forth by relaxing in your garden with your always perfect looking lawn. We’re advised constantly to refrain from wasting water on garden use, in high summer with soaring temperatures you don’t want your meticulously manicured lawn to scorch. Trulawn, being so low maintenance means it never needs watering. With artificial grass there is no need to worry about water drainage, artificial lawns drain water like a regular lawn and even better in some cases. All our grass has built in drainage technology that quickly allows water to pass through the pile and into the ground below. Subscribe to the Trulawn newsletter and be first to hear about our offers, exclusive events and garden tips. Take a preview. Trulawn are NOT associated with the AstroTurf™ brand. 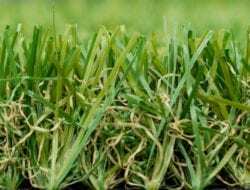 Whilst people use the term as a generic description to describe artificial grass, it is a registered trademark. 2008 - 2019 Tru-lawn Ltd All Rights Reserved.